Does Portland Bolt ship internationally? Yes! In 2018, Portland Bolt manufactured and shipped over 6.3 million pounds of anchor bolts and construction fasteners to customers in all 50 states, 12 Canadian provinces, and 40 different countries.. Typically, we prefer that overseas customers arrange their own freight, but we have the resources to handle the shipping process for you. We can ship to an airport where your company or a freight forwarder will transport the bolts to their destination, or we can arrange a door-to-door shipment. What goes into arranging your international shipment? International deliveries can get complicated but there is some information that we will always request such as the name, address and contact email and phone number for your company, as well as those of the recipient if they are different. We will need your customs broker’s name and contact information in order to file all of the correct export documentation. If you arrange the shipment, then we will need the bill of lading/waybill as well as the name of the carrier. Simply scheduling the pickup is not enough. The bill of lading is the paperwork that allows us to release your shipment to the carrier, and without it, there could be delays. If your company is located in America and you are having us ship to an overseas customer then we will require the commercial invoice, the bill of lading and you will need to provide all of the customs paperwork. Let us know if you require an export crate to transport your bolts as this is often a good idea as it protects the bolts from damage and other disturbances during the journey. 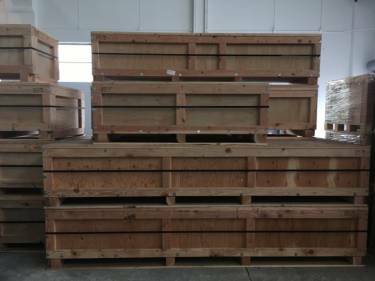 Our export crates and pallets are certified to IPPC standards for overseas shipments. However it best suits your company to arrange the transportation, Portland Bolt has got you covered. Be prepared with the necessary documentation and whether by land, sea or air we will get you there. Call Portland Bolt today and one of our experienced estimators will help you arrange your shipment.